Does Oklahoma Collect an Estate Tax? The answer to this question is No. Currently, Oklahoma does not collect an estate tax at the state level. 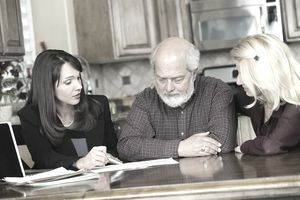 A few years ago, however, things were different before major changes took effect with regard to federal estate tax laws. What do federal estate tax laws have to do with Oklahoma estate taxes? Before January 1, 2005, Oklahoma did collect a separate estate tax at the state level, called a "pick up tax," that was equal to a portion of the overall federal estate tax bill. What is the Pick Up Tax? The "pick up tax" is a state estate tax that is collected based on the state estate tax credit that the IRS allowed on the federal estate tax return, IRS Form 706, before January 1, 2005. Each state had different tax laws with regard to the pick up tax, so the amount that a state would collect varied based on that state's estate tax laws. In essence, however, the overall estate tax bill was not increased or decreased due to the pick up tax. Instead, the total tax bill was apportioned between the IRS and state taxing authority. So what does this mean in plain English? It means that a portion of the federal estate tax was taken away from the IRS and instead paid to the decedent's state taxing authority. As such, prior to January 1, 2005, if a deceased Oklahoma resident owed federal estate taxes, then the Oklahoma Tax Commission collected the pick up tax from the deceased Oklahoma resident's estate. What is the Future of the Oklahoma Estate Tax? The majority of states did absolutely nothing and therefore no longer collect a state estate tax. Oklahoma was among the minority and did enact a separate state estate tax but then ended up repealing it effective January 1, 2010. In addition, while under the provisions of EGTRRA the pick up tax was supposed to return in 2011, it didn't due to the enactment of the Tax Relief, Unemployment Insurance Reauthorization and Job Creation Act of 2010 ("TRUIRJCA"), which reinstated federal estate taxes but did not bring back the pick up tax. Nonetheless, the provisions of TRUIRJCA were set to expire on December 31, 2012, which would have brought the pick up tax back in 2013, but Congress and President Obama acted in early 2013 to pass the American Taxpayer Relief Act ("ATRA"). Under the provisions of ATRA, the rules governing federal estate taxes as set forth under TRUIRJCA were made permanent, which means that the pick up tax was not resurrected in 2013 and will not come back in future years without further action by Congress. Thus, don't expect Oklahoma to begin collecting a state estate tax again any time soon. For more information about the Oklahoma estate tax, refer to the Oklahoma Tax Commission estate tax form website. Does Oklahoma Collect a State Inheritance Tax? The answer to this question is No, Oklahoma does not collect a state inheritance tax.